from 3 pcs. 2,32 EUR ea. from 10 pcs. 2,03 EUR ea. from 20 pcs. 1,89 EUR ea. from 40 pcs. 1,77 EUR ea. 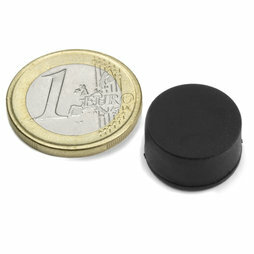 These are the only waterproof neodymium magnets in our assortment. They can be permanently used outdoors, in wet surroundings or even in the water without rusting. The rubber coat around the magnets protects delicate surfaces (whiteboards, magnetic glass boards, painted magnetic walls, etc.) from scratches. The rubber magnets also leave significantly less marks on fragile cards. Rubberised magnets can lead to discolouration on photos - please use Boston Xtra Mini round on them. Thanks to the water-repellent rubber coats, these magnets can be used permanently outdoors without rusting. Therefore, they are the perfect tablecloth holders on a metal garden table. The rubber layer may leave dark stains when rubbed hard against a smooth surface. These stains can be easily removed with a wet cloth, however.